We’d like to thank each agency and sub-agency for their partnership and participation in the Digital Analytics Program (DAP). The data below represents a view from over 4,500+ executive branch websites and the analysis we conducted wouldn’t be possible without you. Since the introduction of the iPhone a decade ago, smartphone and tablet usage has exploded, with 378 million mobile devices in use in 2015. In fact, 49 percent of U.S. households were mobile device-only and used 10 trillion megabytes of data in 2015. This means that our primary way of accessing websites happens on smartphone and tablet devices. Even Google reported that “more Google searches take place on mobile devices than on computers in 10 countries including the U.S. and Japan.” It’s also a sign of the times that Google recently announced their plan to create a mobile-first search results index to cater to the market shift toward Google searches on mobile devices. Mobile usage has changed people’s expectations of how they want to engage with and consume website content. This has spawned the mindset of “mobile first,” where developers exclusively create sites and apps for mobile users first. The shift to “mobile first” makes sense given that the smartphone is now the growth driver, while desktop device usage is rapidly decreasing among U.S. users. U.S. government websites are no exception to this trend. In December 2016, mobile devices (smartphone and tablet) accounted for 43 percent of all traffic vs. 36 percent the same time the year before. We already see the same trend through June of 2017 and it will likely accelerate in the second half of 2017. 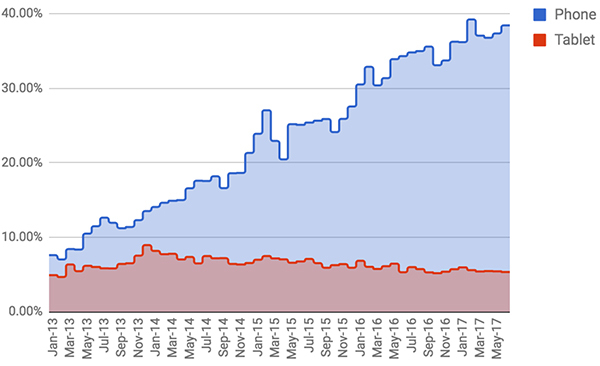 We should caveat that our year-over-year data is not a perfect “apples to apples” comparison because various government websites continually add our DAP web analytics code throughout the year. But analytics isn’t accounting—it’s directional, so we can still look at high level datasets and market share numbers to infer mobile device trends. Now that we’ve seen the top level shift from desktop to mobile, let’s drill deeper into mobile device specific trends. 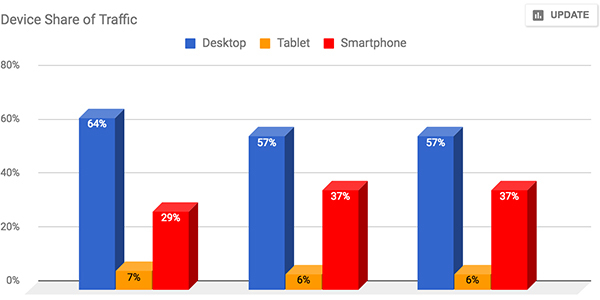 What we discovered is that even though desktop users are switching to total mobile, when we dive deeper into the data we actually see tablet users declining and smartphone capturing the majority of the shift in users from desktop. This trend is already true halfway through 2017. We anticipate smartphone usage to increase more than today’s 37 percent share of total traffic in 2017. 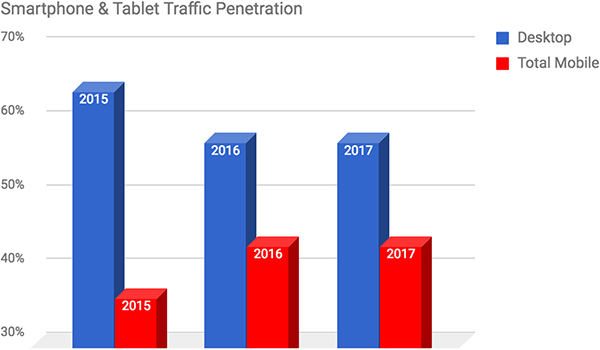 To better understand the shift away from tablets and shift towards smartphones, let’s look at the device types’ share of traffic since the inception of DAP in 2013. Below we see that while smartphones and tablets accounted for equal shares of traffic in 2013, smartphone share of traffic has clearly spiked, while tablet usage has languished. Smartphone usage now accounts for 36 percent of all traffic and is forecasted to continue increasing. U.S. government websites saw a seven percentage point shift away from desktop to mobile devices, with smartphone devices accounting for this shift. This means that our users have a strong expectation of being able to access government websites on smartphones, and they are increasingly expecting government websites to work efficiently and easily present information and services mobile device screens. To be able to better support and engage with our visitors, we need to consider how to develop and design government site experiences that cater to our ever growing base of smartphone users, or we risk frustrating—and even losing—many visitors on sites that don’t support them. This data reinforces that it would be beneficial to make data driven decisions to improve and tailor public access to government websites on smartphones. There is help available if you are not already doing work in your agency to become mobile-friendly. You can use resources like the Federal Mobile CrowdSource Testing Program to test to see if your site is mobile-friendly. You can also join the MobileGov Community of Practice, sponsored by GSA, and work to help make anytime, anywhere government a reality.